To sum-up: Alkali-Activated Materials (AAM) are NOT Polymers, so they cannot be called Geo-Polymers. Geopolymers are NOT a subset of AAM because they are not a calcium hydrate alternative (no NASH, no KASH). They belong to two very different and separate chemistry systems (a hydrate/precipitate that is a monomer or a dimer versus a true polymer). Those who claim that both terms are synonyms are promoting a misleading scientific belief. Learn why by watching these four videos. Get an official transcript of the 4 videos, including a DOI for official references and citations, by downloading the technical paper # 25. 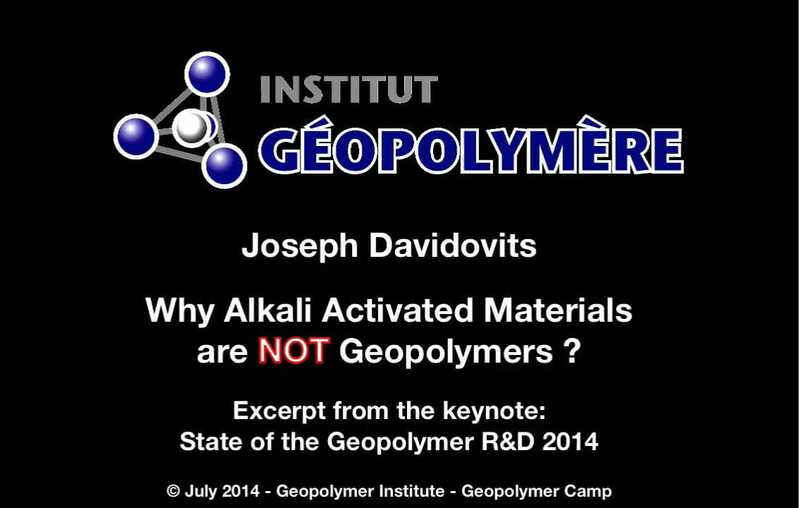 In his four recent keynotes at the Geopolymer Camp 2014, Geopolymer Camp 2015, Geopolymer Camp 2016 and Geopolymer Camp 2017, Prof. J. Davidovits explained why Alkali-Activated-Materials are not Geopolymers, or why alkali-activation is not geopolymerization. We have selected all the sequences that had been dedicated to this issue in the GPCamp-2014, 2015, 2016 and 2017 keynotes. These new videos are titled: Why Alkali-Activated Materials are NOT Geopolymers. You will finally understand why they are two different systems. In 2016, a paper published by a group of scientists determined that there is no presence of NASH or KASH in geopolymer cement (see part 3 below). 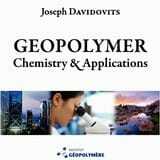 In this short excerpt, Prof. Joseph Davidovits explains this result by the true polymer nature of geopolymer chemistry. You will learn what true NASH and KASH are, and in which context they are actually used. AAM and geopolymer cement (wrongly shorten by some as “geopolymers”) are two very different and separate chemistry (a hydrate/precipitate that is a monomer or a dimer versus a true polymer). None is a subset of the other or its derivative which leads to confused interpretations. 10 min, 26 MB, 3465 downloads. Click on the icon on the right to watch it fullscreen. Prof. Joseph Davidovits emphasizes the fact that Alkali Activated Materials (AAM) are not polymers, so they cannot be called “geopolymers”. He presents what scientists are now writing about this issue. They now agree with proven facts that it is a big scientific mistake to use AAM and geopolymer as synonyms, and people shall stop doing so. Geopolymer cement is not a CSH derivative; therefore, scientists are now stating that applying the CSH terminology from Portland cement is not only inappropriate, but also calling them NASH and KASH is totally wrong. Those who purposefully use and propagate these misleading languages delude the understanding of the true chemical reactions that really occur (never a hydrate or a gel, but a polymer), resulting in confused interpretations. 27 min, 62 MB, 5452 downloads. Click on the icon on the right to watch it fullscreen. Prof. J. Davidovits explains the main differences between AAC (Alkali-Activated Cement or Concrete), AAS (Alkali-Activated Slag), AAF (Alkali-Activated Fly Ash) and Slag-based Geopolymer cement, in terms of chemistry, molecular structure, long-term durability. In a second part, on hand of the industrialization of Slag/fly ash-based geopolymer cement/concrete implemented by the company Wagners, Australia, he focuses on the results provided by the carbonation testing data obtained for ordinary Portland cement, AAS and EFC (Slag/fly ash-based geopolymer). The tests were carried out at the Royal Melbourne Institute of Technology RMIT in Australia. Geopolymer behaves like regular Portland cement, whereas AAS gets very bad carbonation results. 20 min, 46 MB, 17014 downloads. Click on the icon on the right to watch it fullscreen. 29 min, 67 MB, 8128 downloads. Click on the icon on the right to watch it fullscreen.